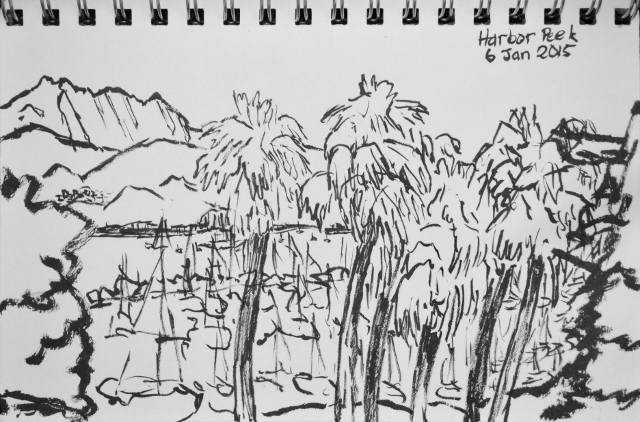 I finally finished off my sketch book (and started a new one) in January. One of the harbor from SBCC with palm trees hiding the boats and White Ledge in the distance. I stopped on the way down Devil's Canyon where the transmission lines of today dwarf the leftover lines of last century. As everyone kept pushing the snooze on trail work on Sunday of VWR training, I wandered around Sage Hill Campground. 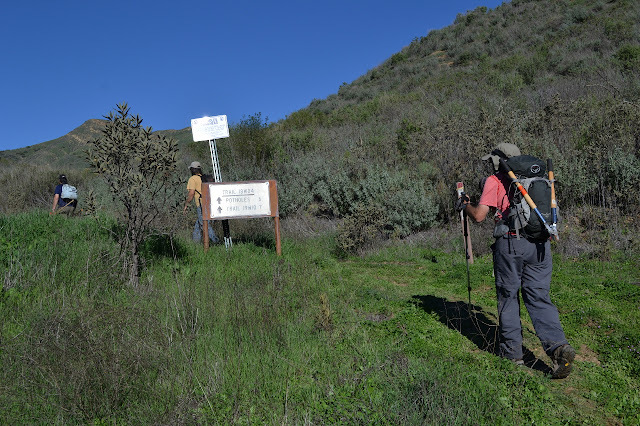 Pothole Trail is the southern end of the proposed Condor Trail, which is a through hiking route for the whole Los Padres National Forest. 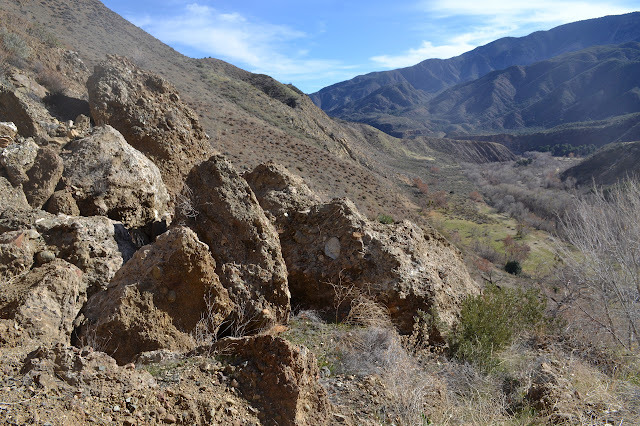 Unfortunately, it is tucked away behind the fee area for Lake Piru, and since Blue Point Campground has been closed, the general public has to park miles from the trailhead. There are plan to change this, but what the time frame on that is, I do not know. For now, people are working to open up the trail again. I found out there would be trail work on Pothole and jumped at the opportunity. 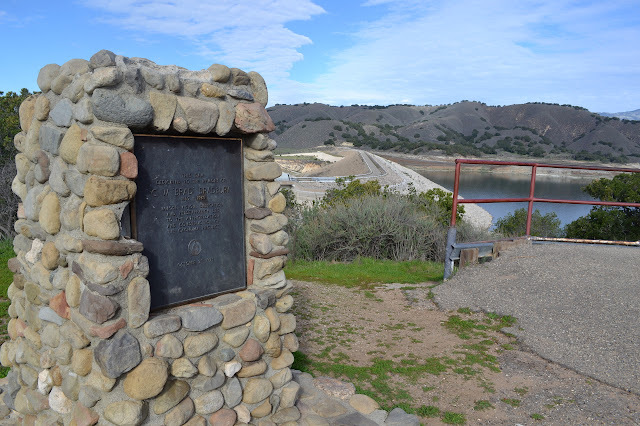 We meet at 8:30AM at the Temescal Fire Station, then head up the road through the pay gate, a locked gate above a picnic area that is the public terminus of the road in winter, and a second locked gate by a boat launch ramp that is the public terminus of the road in summer. We park near a wash just a few hundred feet from the start. Further up are the cars for a very large group (about 50) of Sheriff's deputies and others who are doing what was once a very popular loop up Potholes and down Agua Blanca. Starting up from the signed trailhead to get to the work about three miles up. 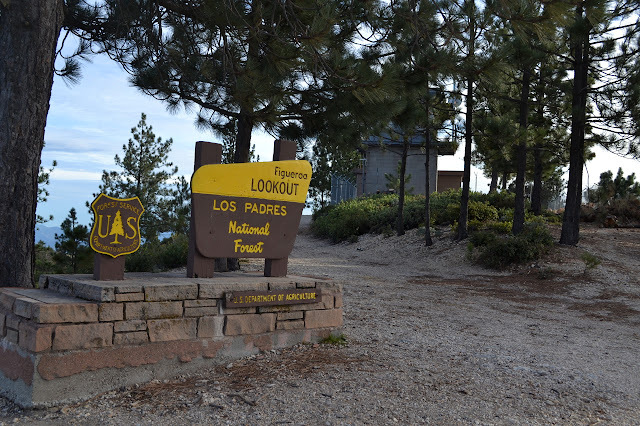 The sign and lookout at the top of Figueroa Mountain. 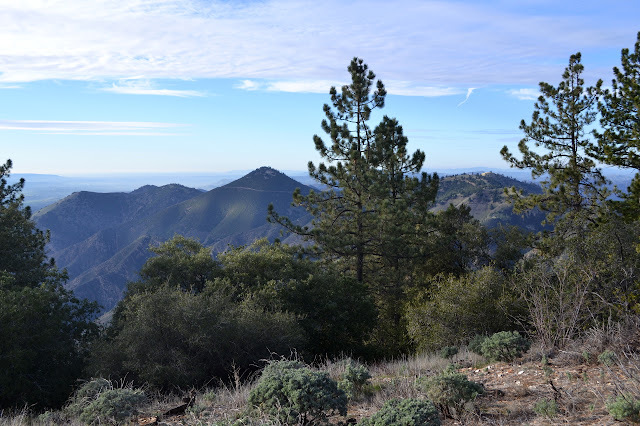 There is a little dirt road to the top of Figueroa Mountain, rough in places but passable to most cars, that leads up to the fire lookout. My only difficulty in getting up it is that the firefighters were out clearing the deadfall and parked anywhere even when the road was narrow. 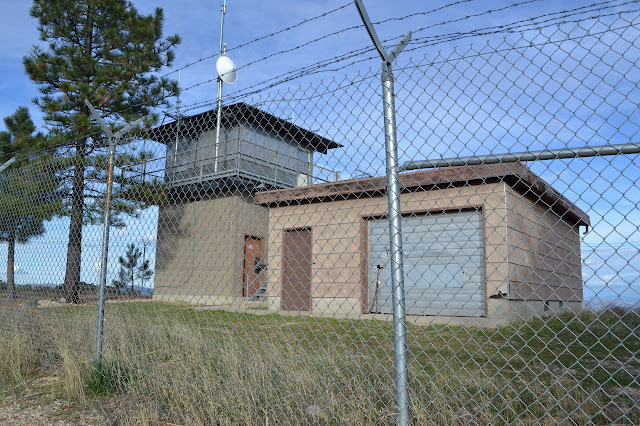 There are also picnic tables and bathrooms and, further out from the top, a small nature trail and campgrounds. I visited the lookout and took in some of the views. 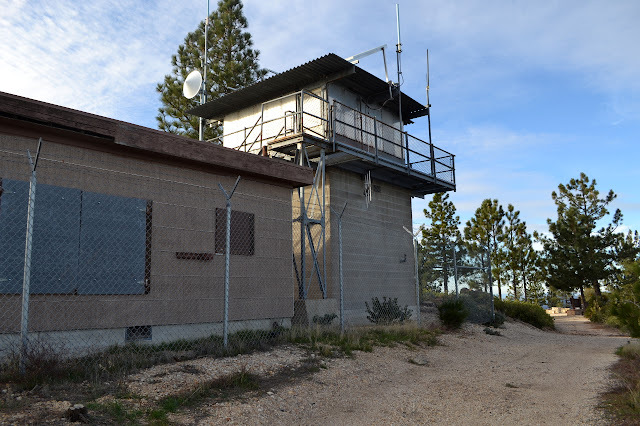 The lookout is fairly modern made of cinder block and metal and looks in good shape, at least from the outside. It has a nasty looking perimeter fence to keep out the commoners. The station benchmark set in 1941. The lookout and accompanying garage. The lookout from the other side. 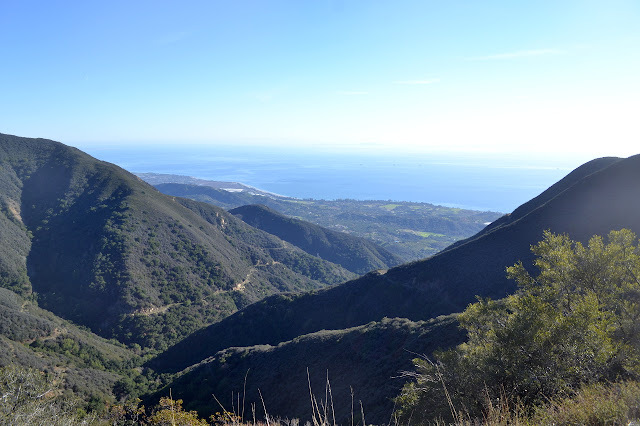 Looking toward Hurricane Deck and San Rafael Mountain. 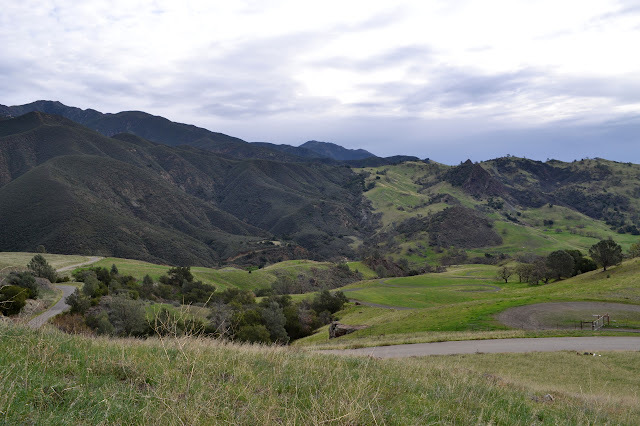 Zaca Mountain, which also has a road out along it and intersects one part of the Condor Trail that is actually signed. I decided to go up to Figueroa Mountain to see the yarn bomb, but first take some little hike in the area. Exploring around the south end of the Ranger Peak Trail looked like a fine spot, but it is also little used and crisscrossed with cow paths, so it can be helpful to have some sort of "bread crumbs" to follow. I added in the local geocaches as such, but they do have a different start than the actual old road. Parking is easy near, but not blocking, a driveway and I start off up the grassy slope along a track marked with "no motor vehicles" signs. It quickly approaches a rock and, although there are some signs of travel to either side, climbs to the top of it for the toughest part of the route. A long driveway with a forest designation on some maps winds down through grassy hillsides under a sky that looks more threatening than it is. It is much nicer down the back side of the rocks and out into more grass that opens up to a wide and lovely meadow. Little purple spots from shooting starts are everywhere. 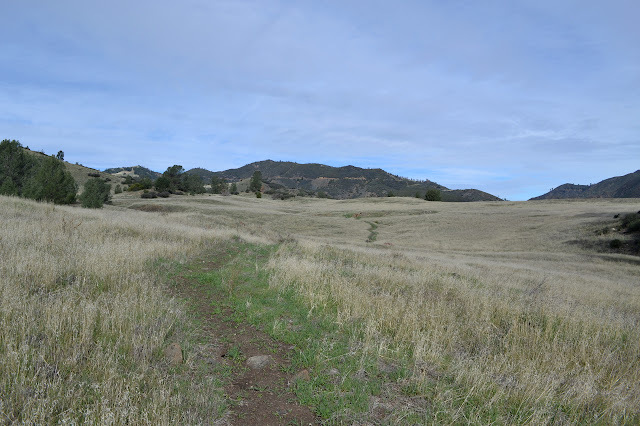 The map marks a meadow somewhere toward the north end of it, but the trail ends in another track that heads off southeast toward a little hill top and northwest along the side of another hill. I head northwest, the general direction of travel for the old road and the direction of the next caches. Trail coming into the wide meadow. Somewhere up the slight dip in the middle, there should be a spring. 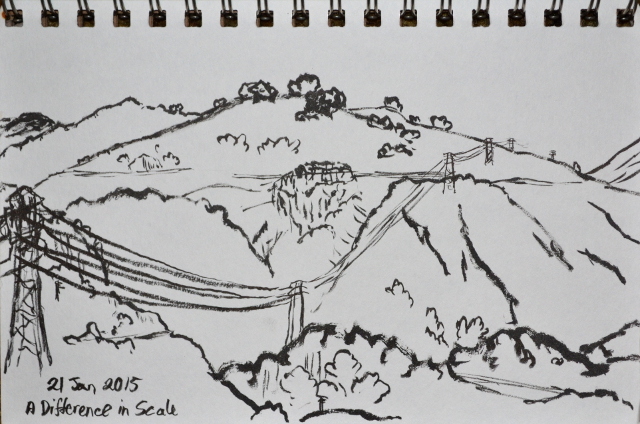 I had decided to go down to Gibraltar Dam by the road, so looked around for a loop to make it better. 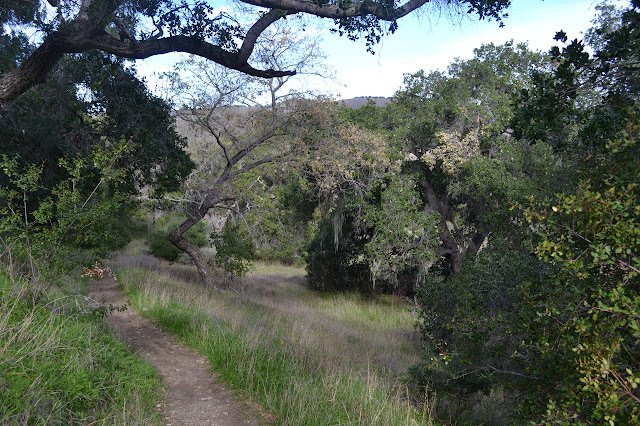 Because I also want to see the mine, I almost went for one going all the way over to Cold Spring Trail and back up, but it seems a bit long, especially the road walk back along Camino Cielo. I noticed a bit of trail heading more directly down to the dam from the road. A little research in my new copy of Hiking and Backpacking Santa Barbara and Ventura (with corrected coordinates for Tule Creek, route 83) shows this to actually be two trails. 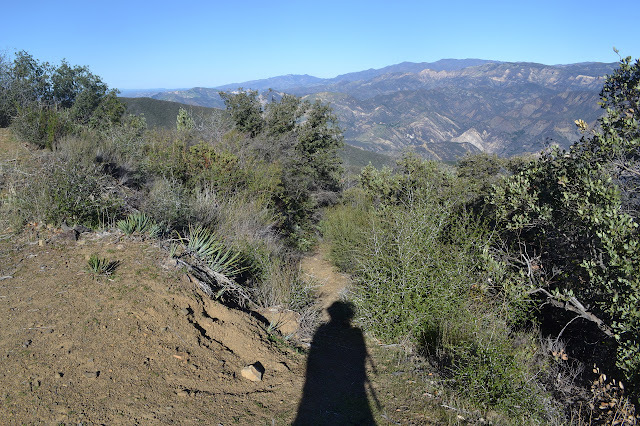 The upper portion of Matias Trail (route 10) and the lower portion is Devil's Canyon (only mentioned in descriptions for the trails at either end). It also mentions that the map shows an unmaintained fuel break as the route while the actual trail leaves the road much closer to the top. There is plenty of parking at the top of the road. Past the locked gate, the view opens up quickly. 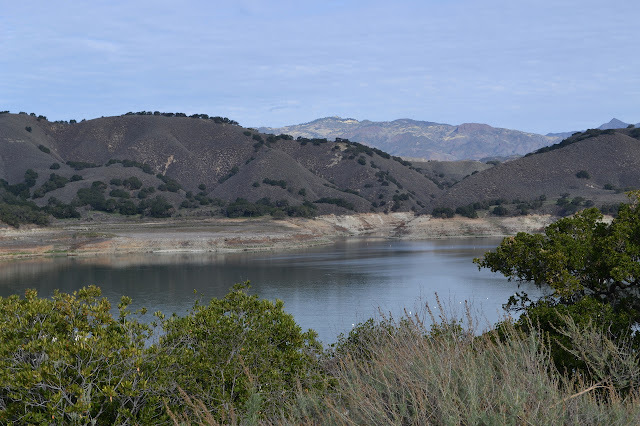 The hills are getting very green, but the reservoir is still low. I can see the trail traveling along the side of a ridge below, but do not see the top by the first outside bend. From a little lower, I can see it crawling up very close to the bend below power poles that match the old lines that come up Tunnel Trail. Climbing back to the curve, there is a trail that looks rather hard to miss even though it is unsigned. The dammed up reservoir far below and the trail along a ridge a bit closer. Sun at my back and trail before me. 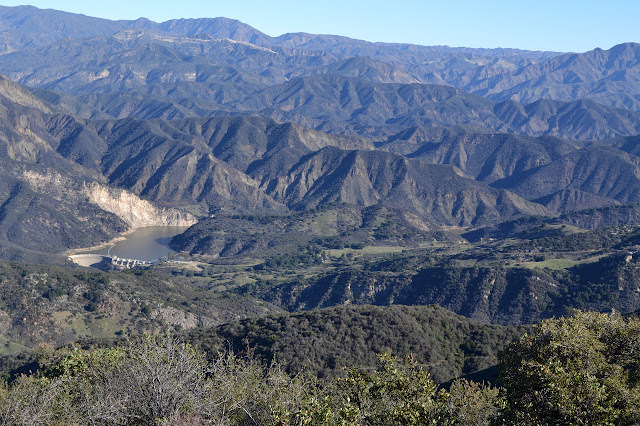 The Sweetwater Trail winds along the edge of Cachuma Lake between the main recreation area and the view point for the dam. It looks like it will be a good one to take mom on, so we head out to the view point where parking is much cheaper. This spot does indeed give an edge on view of the dam. There is also a dedication to the namesake of the dam. Dedication sign with Bradbury Dam in the background. Looking out, the high water line is well above the current level of the lake. The trail is unmarked on this side, but very clear as it leaves the south side of the parking lot beside the bathroom. 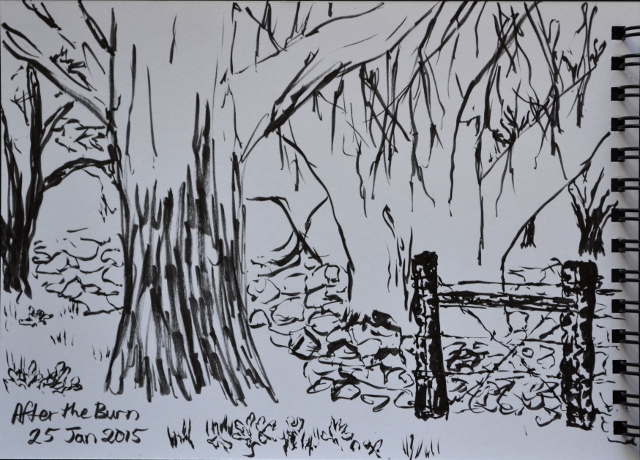 We start down it, passing by some sage, then drop down a short hill under large oaks hanging with Spanish moss, A.K.A. French beard. The water is so far away that we are quickly distracted by a smaller path leading to it and take it. 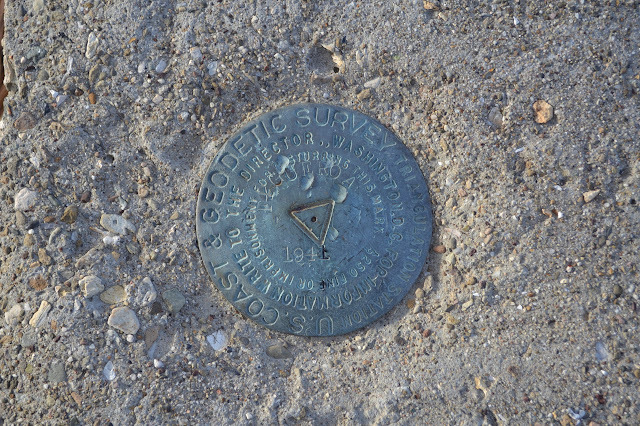 I am even further distracted from this new path by an iron post painted white that turns out to be a witness post for a benchmark labeled "L-C". A few steps further down the path, I am distracted again by a sighting post that is wired to stand above a benchmark labeled "L-A". On a hunch, I poke around between the two to find "L-B" as well. On the other side of the trail, more debris caches my eye, but it is just the items that tend to wash up into this inlet when it is covered in water. Dropping into a section of oaks hung with Spanish Moss. (Day 2 of 2) We wake in the morning covered in a thick layer of ice. The heavy dew froze in the night and our water bottles followed suit to large extent. I tuck back in to wait for the sun to rise. It is not that long a wait and the ice melts quickly and everything is mostly dry soon after. A little breakfast and water gathering from the creek because I have forgotten that the faucets work and Bernard heads off for some more soaking while I poke around up the other road cut. A cluster of composite stones at the end of the road to the cold spring. The stock meadow of the camp stretches out below. (Day 1 of 2) Bernard and I are heading into the Sespe to reclaim a garden gnome called Jeff from the wilderness. It is halfway to the hot spring, so we are dropping by there too because it seems like a good time to do so. Also, it is hard to justify the trip just for the garden gnome. Bernard has never been to the hot spring and I have only been this last summer, it should be a completely different experience. I was hoping to do such a trip with a day hike to Hines Peak in between coming and going, but Bernard's schedule does not allow that. There are only a few parking spots in the lot as we pull up at a fairly lazy hour. A few early risers are already finishing their hike out. We go this way. Looking east over the gentle land the river cuts through. 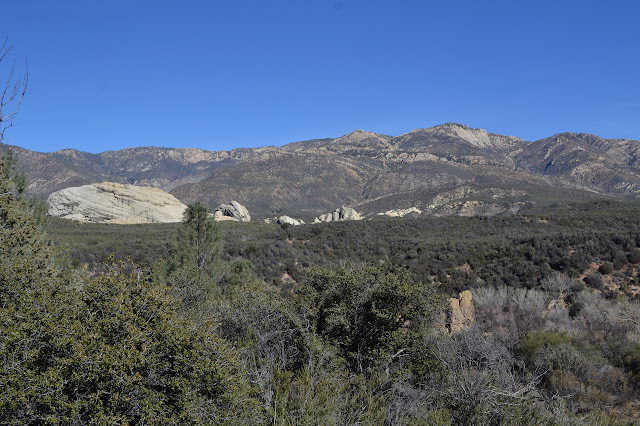 Piedra Blanca pokes out from the chaparral to the north with Pine Mountain behind it. Some will be going to or past it instead. I thought a little bit more about where I might take my mom that was both interesting and mild enough for her. 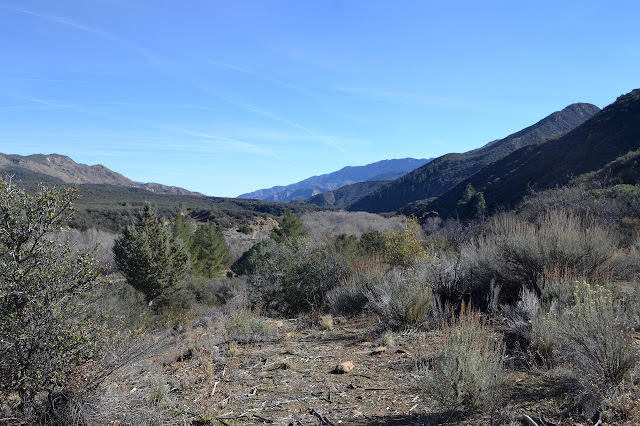 My conclusion: the upper section of Romero Canyon Road, although the distance and the deceptive nature of going downhill first gave me pause. The distance is not that much too long and turning around can always be done early. She agreed to it and so we drive up to Romero Saddle and start on our way. Checking out the road much lower than we will be going.